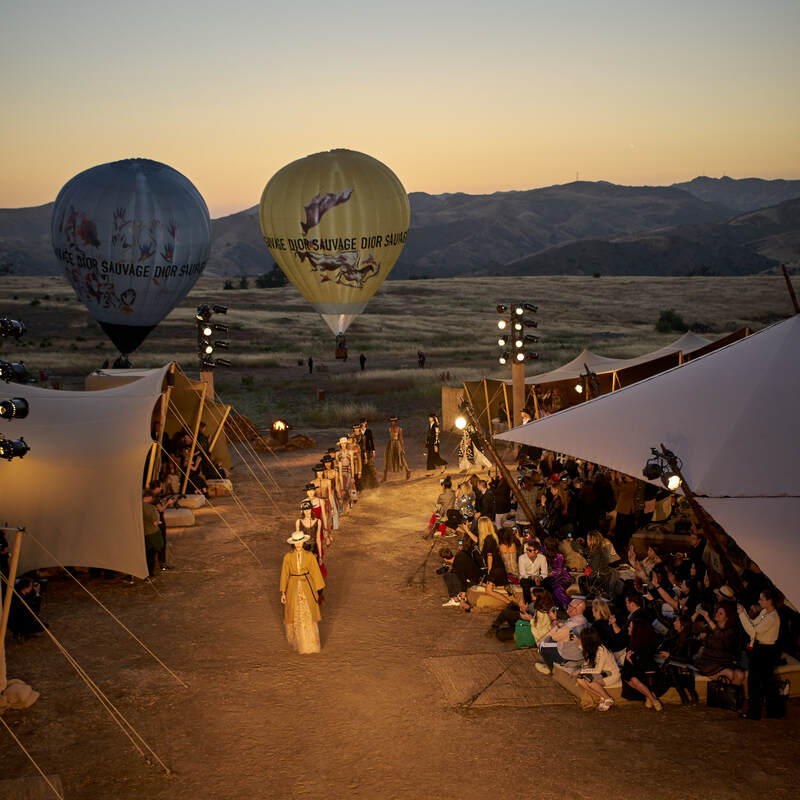 The Dior show happened in the upper Las Virgenes canyon preserve, Calabasas, California, a remote mountaintop which is home to mountain lions, snakes and the Kardashians. The space was revamped into a camp of Bedouin tents with a pair of Dior hot air balloons hovering in the distance. Guests in attendance included Rihanna, Charlize Theron, Miranda Kerr, Jessica Alba, Solange Knowles and over 700 locals and out of town guests. Churi restyled fringe on the edges of the outfits from the collection. Fur intarsias stood out among the rest with an intermingling of earthy hues and cave printings. Transparent panels were adorned with colourful studded beads and see-through peeps of lace held discreet and charming cut-out details. Lascaux sketches of bulls, deer’s and wolves and tarot prints on the silk raffia jacquard induced a primitive tribal sense in the collection, whilst cave printings on ponchos and motif prints on leather added an edgy finish. A real highlight was a khaki mid-length coats and trousers, injecting a sense of androgynous power to the range. As well as tribal influences, Dior also visited the Georgia O’Keeffe exhibition on a recent visit to New York and there were aspects from this reflected in the show and evoked within the attendees. It was a show that was both impressive and enchanting, offering a modern interpretation of Dior’s impressive archive. This entry was posted in PFW, Trend Reports and tagged dior, Resort 2018. Bookmark the permalink.